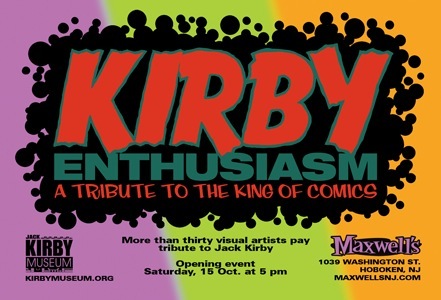 This Saturday (October 15) at 5pm, legendary rock club Maxwell's in Hoboken will open its Kirby Enthusiasm art show in its front room. More than 30 visual artists have contributed work paying tribute to "The King of Comics." At 7pm, in the back room, the Kirby Enthusiasm rock show will start, with WEEP (featuring the Venture Brothers' Doc Hammer), WJ & The Sweet Sacrifice and (formed for this occasion) The Boom Tubes! If you're at New York Comic Con, Maxwell's is easy to get to from the Javits Center - take a ferry at 39th Street across the Hudson to Hoboken North and walk a few blocks to 1039 Washington St. The art is awesome - the music is gonna rock - Kirby Enthusiasm! Here's my contribution to the show: A 24x24" painting of Carroll Baker starring in the reel-to-reel tape audiobook, Flower, Daughter of Googam. There might be a 12x12 print for sale at the show, which is based on the Illustrator preliminary drawing I made. I'll find out if it is available for sale online.